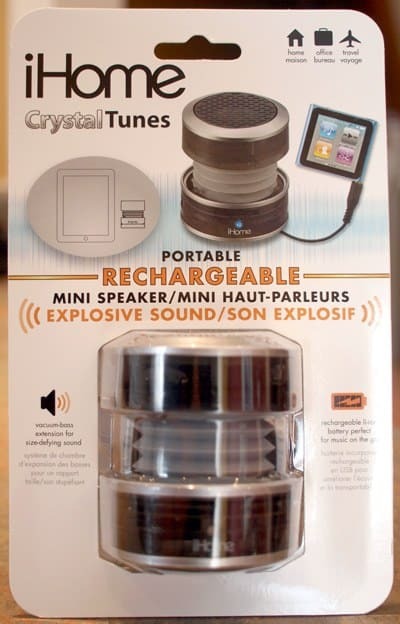 I’ve been on the hunt for mini portable speakers for my travels for quite a while now. Music is important to me, and although I love listening to local music/artists in whichever country that I’m visiting, there is nothing like kicking back on a beach or cruise ship balcony and listening to your favourite tunes from home on your mp3 player. I researched a few brands/models, purchased them, ended up not liking them for various reasons and then returned them. The portable speakers I checked into were Go-rock mini, Aluratek Bump, X-mini II. the ones that sounded good were too expensive – again this is for portable travel and I don’t want to worry about theft etc. 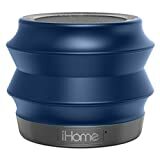 Then I stumbled onto the iHome Speaker. PLUS it’s so darn cute! You can see the top of the speaker compared to a Canadian quarter so you can visualise the actual size. 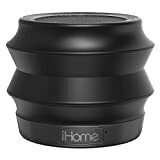 One thing to note, be careful when opening and closing the portable iHome speaker. The little clip mechanism that holds the speaker shut is made of plastic and isn’t the best, but I figure it can’t be perfect. 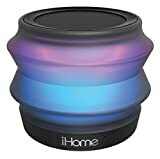 Do you travel with portable mini speakers? I’d love to hear which ones you like. Good call posing it with the quarter – you really get an idea of how tiny (and hence travel friendly) these speakers are. We need to get some speakers like these. We’ve got a pontoon boat we keep on a lake near our house, and the speakers are blown. These would be perfect! I have also tried a bunch of different portable speakers with varied results. I will have to check this one out. I was wondering about that speaker. Very cool that you can daisy chain them! 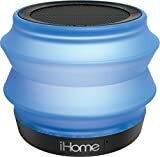 I really love the Wowee One speaker, it is also re-chargable and uses whatever surface you put it on to create bass! Thanks for sharing this, Mary! I’ve been through 2 sets of speakers in a year (a lot of rough and tumble in the classroom!) so maybe I’ll think about getting some more soon. Great review. My old iPod speakers were huge. Good thing – they came with international adaptors. Used to take them to Europe all the time. Now, I just play the music straight from the iPad. It is rare when I am traveling that I am concerned enough about sound quality to justify a speaker! Check them out – for the price I think they are excellent. We actually bought a second one so that hubby and I didn’t have to fight over them and we could daisy chain them together BUT the 2nd one came with a little carrying bag and mine didn’t! So be aware of that. Not sure if it’s the release date or if it was a bonus of some sort because the speakers are identical. Just one came with a bag and one didn’t .